Here at Lottoland we pay out prizes which can run into hundreds of millions of dollars. In fact our most recent millionaire won no less than £79 million from her EuroJackpot bet. The question that we get asked on a regular basis is just how is Lottoland able to pay out such vast sums to our jackpot winners? Here we are going to explain just how such monumental amounts can be paid and why we are able to offer guaranteed prizes worth hundreds of millions. When Lottoland was established in 2013 with a staff of just 7 people, we had no way of knowing there would be 350 Lottoland employees in four different continents just a few years later. In that time Lottoland has won numerous prestigious awards and has been listed as one of Europe's fastest growing companies. Lottoland is the home of the world's biggest Bingo game, the world's largest scratchcard prize and the first ever fully-regulated Bitcoin Lotto. 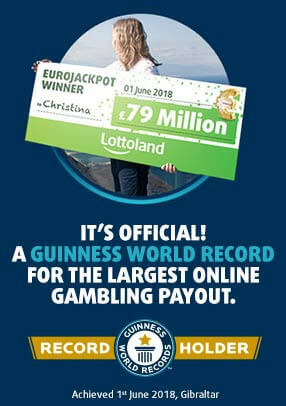 Plus we have paid out a world-record online jackpot of an incredible £79 million to one lucky Lottolander. 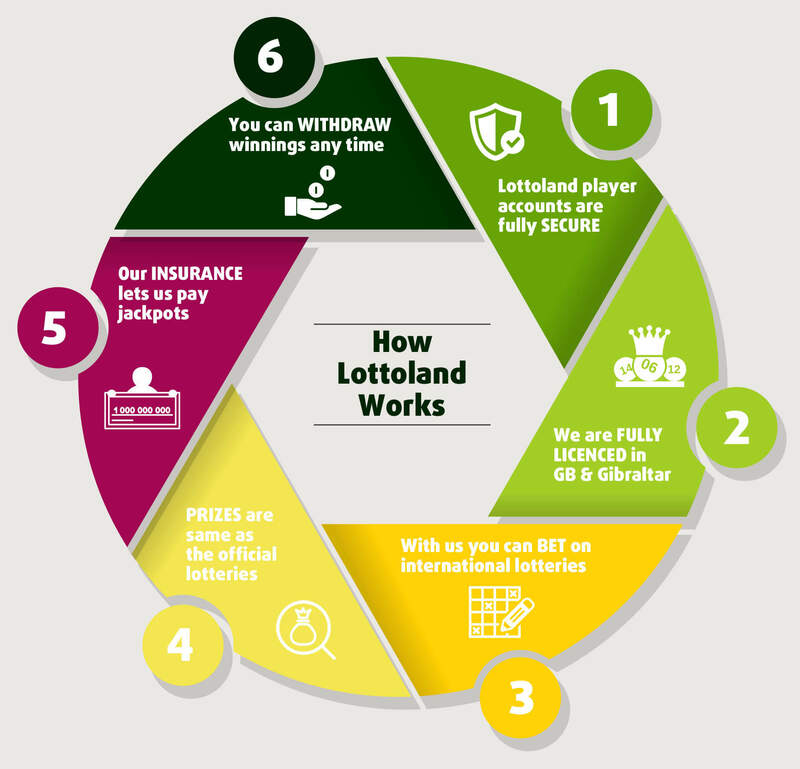 As you can see, there are a whole lot of reasons to choose Lottoland when it comes to betting on a host of international lotteries. Special features like Double Jackpot, Numbershield and Syndicate Bets open up a world of possibilities. What are you waiting for? First there was a small syndicate, which had placed a bet on the Spanish 2015 Christmas lottery. Their luck was in and they won the El Gordo lotto bet to take home a whopping 4 million euros. In March 2016 we were celebrating another lucky winner who took home a prize of over 3 million euros following a bet on the German Lotto. Prize payouts of this size are entirely covered by the stakes of our customers. This means that the transfer of funds can happen immediately, and the champagne corks can start popping. Jackpot wins in the high double-digit million range such as those fortunate winners from February and April 2016 and above all our world record holder Christina lead to enormous media coverage. Then questions arise that we would like to answer here and now: How do the lucky winners get their money? This is where it gets interesting. Paying out wins that could run to hundreds of millions simply is not possible by using customer stakes alone. Instead, Lottoland has taken advantage of Insurance Linked Securities (ILS for short). This insurance model was developed to provide insurance against natural disasters such as heavy storms or earthquakes. Now a lottery win is anything but a disaster, pretty much the opposite in fact. But when it comes to those multi-million jackpots, we need to insure ourselves. Our ability to make payments is one of the conditions of our official licenses in Gibraltar (EU), England, Ireland, Italy and Australia. We have been able to prove our ability to pay any jackpots in the past and must be able to do so in the future. Above all, not only do we have the ability to pay out huge lotto betting jackpots but we also have the desire to pay them out as often as possible. For particularly high pay-outs it goes like this. We pay premiums to an insurance company, which insures us against a major jackpot win occurring. The funds from this insurance are then immediately available to us in case of a big lottery betting jackpot win. For example, the transfers to the three aforementioned multimillionaires could be processed without any unnecessary delays. At the end of the day, the very complex processes of the financial world are the focus of our own risk department. Their main task is to fully hedge all profits, from the smallest amount to the jackpot worth billions, from scratch cards to bets on the EuroJackpot, and guarantee that we will be able to pay every single one of our winners, large or small. The world's largest jackpots are ready for you today. Whether you are interested in the giant American lotteries, or the double jackpot option available at numerous other international lotteries, then we’ve got you covered. After paying out a big £79 million so recently, we are now looking forward to paying out an even higher prize to a new winner - hopefully one from the UK this time around! Will you be that lucky winner? Would You Be a Generous Lotto Winner?